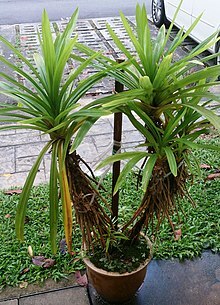 Pandanus amaryllifolius is a tropical plant in the Pandanus (screwpine) genus, which is commonly known as pandan (/ˈpændən/), and is used widely in South Asian and Southeast Asian cooking as a flavoring. Pandanus latifolius Hassk. nom. illeg. The characteristic aroma of pandan is caused by the aroma compound 2-acetyl-1-pyrroline, which may give white bread, jasmine rice, and basmati rice (as well as bread flowers Vallaris glabra) their typical smell. The plant is rare in the wild, but is widely cultivated. It is an upright, green plant with fan-shaped sprays of long, narrow, blade-like leaves and woody aerial roots. The plant is sterile, with flowers only growing very rarely, and is propagated by cuttings. In India and Sri Lanka, it is called rampé; in Bangladesh, it is called pulao pata (পোলাও পাতা ); and in the Maldives, it is called ran’baa along with the other variety of pandan there (Pandanus fascicularis), and is used to enhance the flavor of pulao, biryani, and sweet coconut rice pudding, or payesh if basmati rice is not used. It acts as a cheap substitute for basmati fragrance, as one can use normal, nonfragrant rice and with pandan the dish tastes and smells like basmati is used. The leaves are used either fresh or dried, and are commercially available in frozen form in Asian grocery stores of nations where the plant does not grow. They have a nutty, botanical fragrance that is used as a flavor enhancer in many Asian cuisines, especially in rice dishes, desserts, and cakes. The leaves are sometimes steeped in coconut milk, which is then added to the dish. They may be tied in a bunch and cooked with the food. They may be woven into a basket which is used as a pot for cooking rice. Pandan chicken, (Thai: ไก่ห่อใบเตย, kai ho bai toei), is a dish of chicken parts wrapped in pandan leaves and fried. The leaves are also used as a flavoring for desserts such as pandan cake and sweet beverages. Filipino cuisine uses pandan as a flavoring in buko pandan fruit salad, as well as rice-based pastries such as suman and numerous sweet drinks and desserts. Bottled pandan extract is available in shops, and often contains green food coloring. P. amaryllifolius leaves have a number of local medicinal uses. Leaf extracts have been thought to reduce fever, relieve indigestion and flatulence, and act as a cardiotonic. The leaves possess a pleasant aroma and can be used as natural air fresheners. In Thailand, cab drivers sometimes use pandan for this purpose. ^ "The Plant List: A Working List of All Plant Species". Retrieved 29 March 2015. ^ Wongpornchai, S.; Sriseadka, T. & Choonvisase, S. (2003). "Identification and quantitation of the rice aroma compound, 2-acetyl-1-pyrroline, in bread flowers (Vallaris glabra Ktze)". J. Agric. Food Chem. 51 (2): 457–462. doi:10.1021/jf025856x. PMID 12517110. ^ Sukphisit, Suthon (2018-12-09). "Reading the leaves". Bangkok Post. Retrieved 2018-12-09. ^ IJsselstein. "Lyn's Recipes Corner". Buko Pandan Salad. Jeroen Hellingman. Archived from the original on 26 October 2011. Retrieved 18 October 2011. ^ N., Cheeptham; G.H.N., Towers. "Light-mediated activities of some Thai medicinal plant teas". Fitoterapia. 73 (7–8): 651–662. Archived from the original on 18 July 2017. Retrieved 2 December 2017. ^ Simmons, Holley. "This tropical plant gives foods a nutty flavor — and surprising color". The Washington Post. Archived from the original on 8 January 2019. Retrieved 8 January 2019. ^ "All You Need to Know About Pandan". Michelin Guide. Michelin. Archived from the original on 8 January 2019. Retrieved 8 January 2019. Li J. and Ho S.H. (2003). Pandan leaves (Pandanus amaryllifolius Roxb.) as a Natural Cockroach Repellent. Proceedings of the 9th National Undergraduate Research Opportunities Programme (2003-09-13). Wikimedia Commons has media related to Pandanus amaryllifolius.